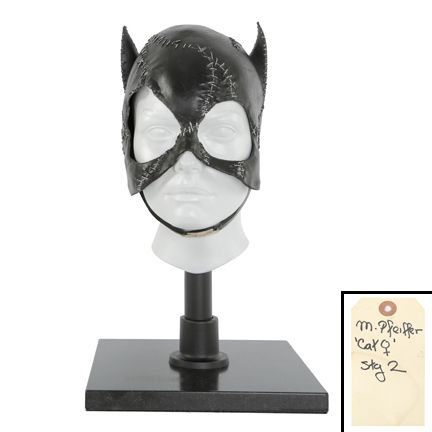 This costume was worn by the character, “Catwoman” portrayed by Michelle Pfeiffer in the 1992 film, “Batman Returns”, directed by Tim Burton. This costume includes a hero latex suit, which was custom made specifically for Michelle Pfeiffer and created from a mold of her actual body. 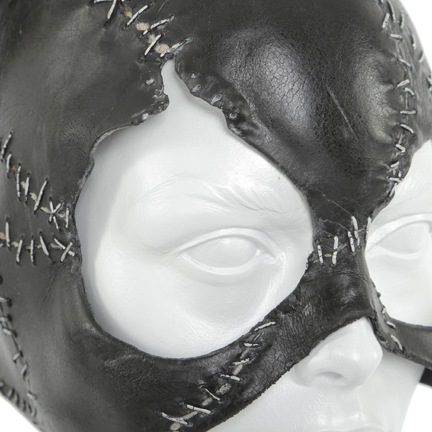 A “stage 2” rubber cowl on a custom form is paired with this suit. The cowl has an internal red dot, which identified the hero cowls, and costume tag attached with, "M. Pfeiffer 'Cat ♀' stg 2”. 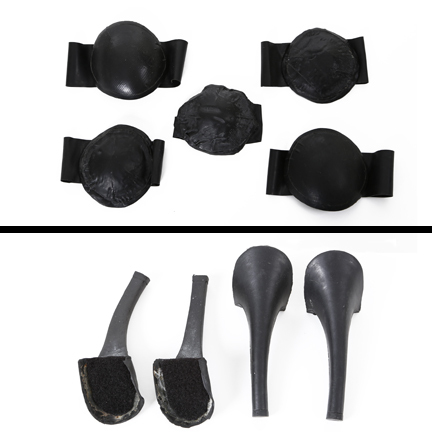 An aluminum strip is inserted along the bridge of the nosepiece, which contoured the mask to Pfeiffer’s face. Sculptor Jose Fernandez hand made the aluminum nose bridges and his inspiration was the flexible metal bridge in painter’s masks. 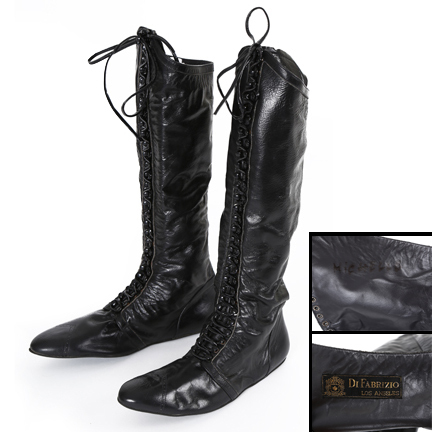 Also paired with the costume is a “stage 3” corset with "Michelle Pfeiffer" handwritten in the interior bodice, one pleather glove, protective knee and elbow pads worn beneath the latex suit, boots by “DiFabrizzio” with “Michelle Pfeiffer” hand written, soft and hard heels utilized for stunt scenes, black socks, and laces labeled “too short”. Ms. Pfeiffer appeared as Catwoman throughout most of the film, and her costume went through three stages of distress as the story progressed. 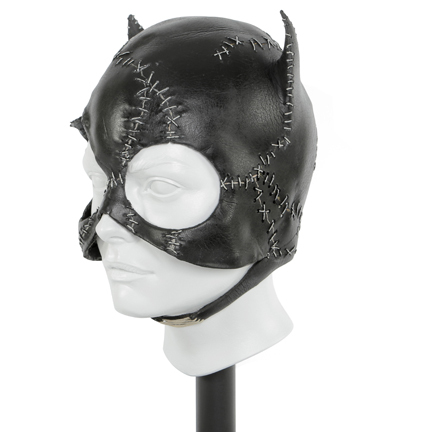 This latex suit is the first stage of the costume, after Selina Kyle constructs it from a leather jacket upon suffering psychosis. Selina had just survived a fall after Max Schreck (Christopher Walken) pushed her out of his apartment window, leaving her for dead. Selina takes on the persona of “Catwoman” and devotes vengeance against Schreck. The suit is notably seen when Catwoman meets Batman (Michael Keaton) and the Penguin (Danny Devito) for the first time after destroying one of Schreck’s department stores, and they head to the rooftops where Catwoman aggressively pounces onto Batman. 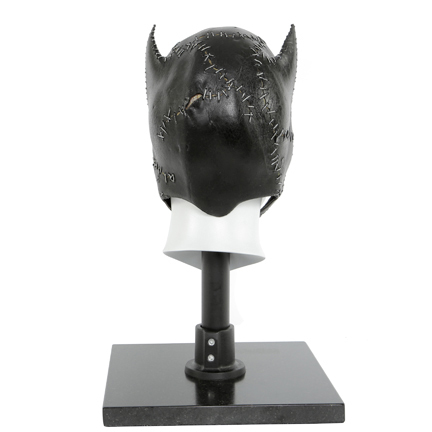 The “stage 2” tattered cowl is notably seen when Catwoman meets Penguin above his mayoral campaign office and convinces him to partner against Batman. 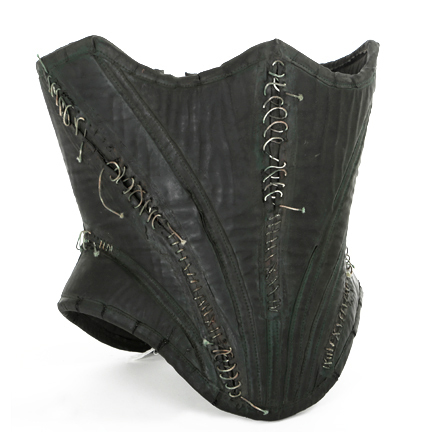 The “stage 3” tattered corset is worn during the climactic scene in the abandoned Gotham Zoo after Batman reveals that he is Bruce Wayne. Schreck fails to kill Selina with gunshots and she kisses him while grabbing a power line, electrifying them both. Famed production artist José Fernandez was commissioned to sculpt Michele Pfeiffer’s Catwoman cowl. 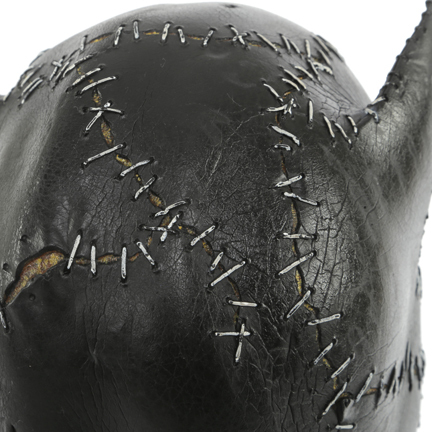 There were a total of thirty-six cowls made for the production of Batman Returns, with nine for each stage of distress. Almost all of these cowls were destroyed or deteriorated during production. Mr. Fernandez was commissioned to restore this cowl and create a custom form to stabilize and preserve the foam. He hand sculpted Ms. Pfeiffer’s head and facial features from clay, capturing her exact likeness from the film.